The world famous street goes traffic-free. Image: Mark Hawkins in the Londonist Flickr pool. 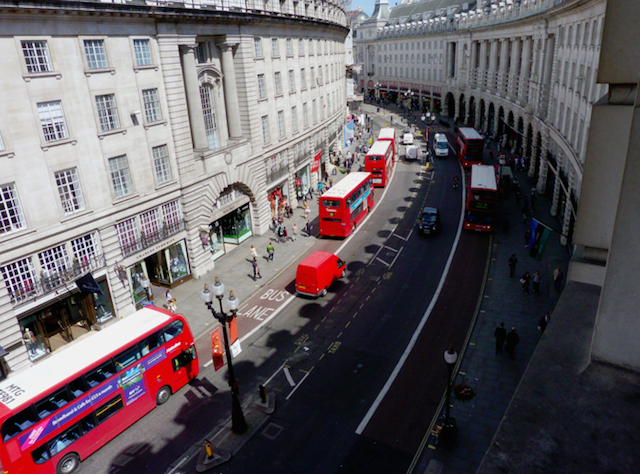 Regent Street goes traffic-free every Sunday this month, giving pedestrians a chance to shop without the constant stream of red buses and black cabs hampering their efforts. Every week, 100 benches will be installed on the street for weary window-shoppers, while bicycle parking facilities and bike MOTs will also be available. Each Sunday has a different theme. First, the Regent Street Garden Party comes to town on 6 July when the street will be transformed into a real life garden. Some retailers will be peddling their wares out on the street - Hamley's for example will have a special garden with activities for children. Entrants to the Mayor's Busking Competition will also serenade the crowds. But if that's too much summer for you, ICEBAR LONDON will bring out ice sculptures and Husky dogs. 13 July sees foodies take over with sixty culinary stalls lining the street as well as a strawberry dipping bar courtesy of Godiva. Eat and relax on the vintage deck chairs provided by Folli Follie and imagine you're down by the sea. The following Sunday, the 20 July sees a fashion-themed makeover with a 100m catwalk installed as the street is turned into a Mile of Style for people to strut their stuff. Summer Streets 2014 culminates on 27 July with a celebration of the 25th anniversary of ice cream brand Magnum. 25,000 ice creams will be distributed to hungry shoppers, with live music played all day. Summer Streets takes place on Regent Street every Sunday 6-27 July. And don't forget, until 15 July you can see the Lego bus stop outside Hamley's made of 100,000 plastic bricks. For more retail therapy, see other shopping events and markets happening in July.